I spent Saturday through Wednesday in Chicago on another of these nine quarterly retreats with Ruth Haley Barton’s Transforming Community. And while Mary and Hannah and I did some really great things up there, I’m struggling to get caught up with all the really cool things we missed here at home. We always try to work in a fun event or two in Chicago as a needed balance to the oftentimes difficult self-reflection and introspection that happens on these retreats. 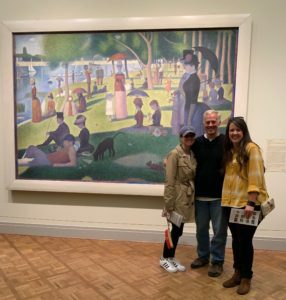 We’ve been to a White Sox game, we’ve taken in the architectural boat tour (a lot more fun than it sounds), we’ve been to Harry Carey’s restaurant, and we’ve done the Bean downtown, Grant Park, and a comedy club. This time around we scheduled two things: the Chicago art museum and Hamilton. 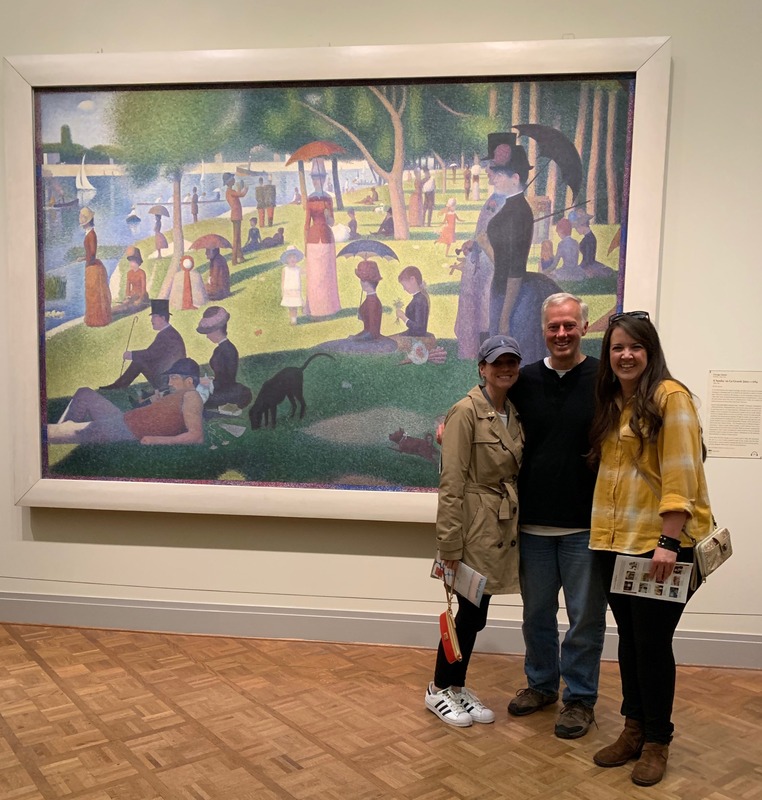 You know we had to get a picture with the Ferris Bueller painting and Hannah had to get reprimanded more than once for getting too close to the art. 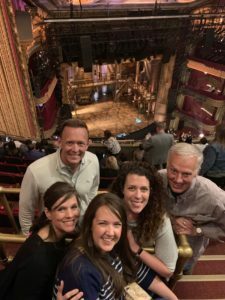 And then Tuesday we hooked up with Grace, who lives in California, and Phil, who lives in another part of Texas — they’ve both become great friends — and saw “Hamilton” together at the historic downtown Chicago CIBC Theatre. The words came way too fast for me, but what a show! I wish I could see it again because I know I missed a bunch of funny, clever lines. The moving stage, the creative writing, the over-the-top performances, the comedy, the history — very impressive! So, while we were away, Virginia topped Texas Tech in overtime to win the national championship. That’s fine. Nobody wanted Texas Tech to win. Except Tiffani and George. And they finished first and second in our annual Central staff bracket contest. Bragging rights and a free lunch. And, yes, Tiffani’s guns are up all year around. Heading into the Elite Eight, I was in first place and still had all four of my Final Four teams alive. I just needed Duke or Purdue or Kentucky or Gonzaga to win. Just one of those four teams. Just one more win, it didn’t matter who it was. But they all four lost and I’m watching it from a tiny TV at Lou Malnati’s Pizza in Chicago. Good thing I had that deep dish supreme to console me. Final numbers: Tiffani-75, George-72, Kevin-71, Allan-70. The Amarillo Sod Poodles opened up their inaugural home season in our brand new downtown ballpark on Monday. And I missed it! So we got there as fast as we could — last night — and watched our AA San Diego Padres affiliate beat the Corpus Christi Hooks in an entertaining slug fest. It was cold, too cold for baseball. 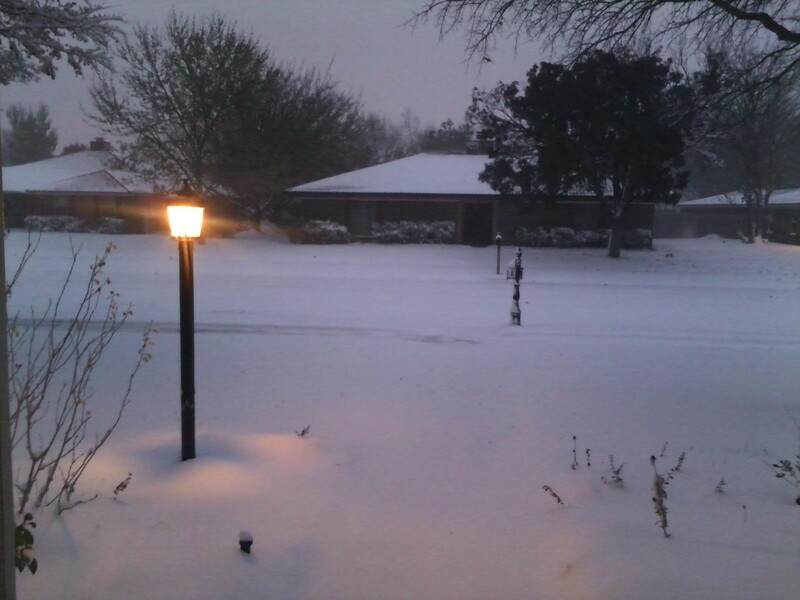 But that’s always going to be Amarillo in April. 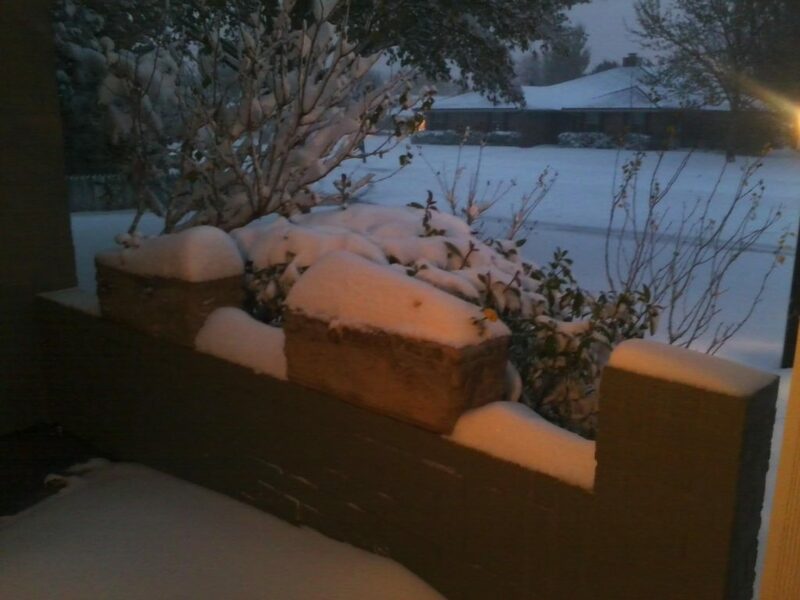 It was 88-degrees on Wednesday and then 53-degrees yesterday. 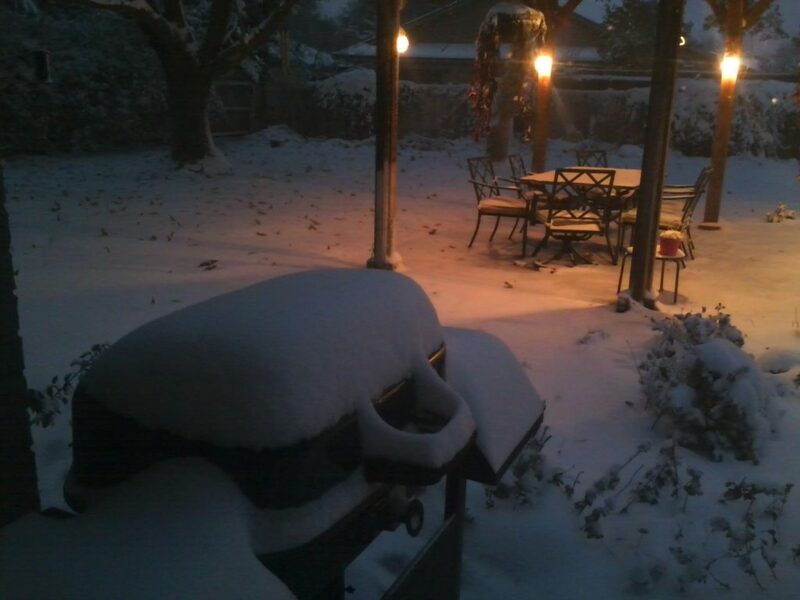 I’m going again Sunday when it’s supposed to be in the lower 70s. 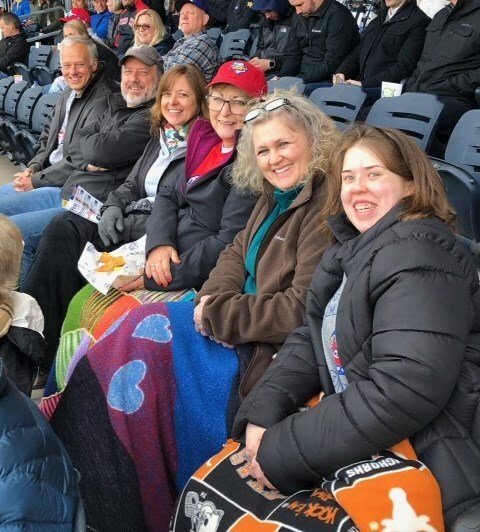 This is Whitney, Carrie-Anne, Karen, Mean Jean, Greg, and me trying to stay warm in Dale and Karen’s great seats behind home plate. What a beautiful ball park! I’m hoping to make about 30 of these games this summer. I also missed Dirk Nowitski’s last game as a Dallas Maverick and I’ve had to go on-line to watch the stirring tribute the Spurs gave him in their arena in San Antonio. If you haven’t seen it, you must watch this video. I’ve always admired the Spurs as a classy organization with a lot of pride and professionalism. We’ve all come to expect that from the Spurs. But they cranked it up a few notches for Dirk’s last game. During the introductions, they showed a video of Dirk highlights, mostly of Dirk dunking on Tim Duncan and shooting over Tony Parker and faking out Manu Ginobelli — it was a highlight reel of Dirk beating the Spurs! How really cool and unexpected! The Mavericks and Spurs are bitter Midwest Division rivals and they have played some significant games against each other over the years. There was about a ten year period there where the stakes were incredibly high every time these two teams faced off. And the highlight reel brought Nowitski to tears. And if you have a heart at all, it’ll probably choke you up, too. Lastly — man, this is sports-heavy today — the NHL playoff season has begun and the Dallas Stars are in. Wednesday night they came from behind to beat Nashville 3-2 in the best-of-seven opener and I watched every exciting minute of it. It’s been a while for the Stars and I forgot just how intense and crazy the NHL’s second season really is. Breath-taking. Edge of your seat. So much fun. It’s border-line blasphemous to say, but NHL playoff hockey is better than football. Game two is tomorrow. Go Stars. They did it. 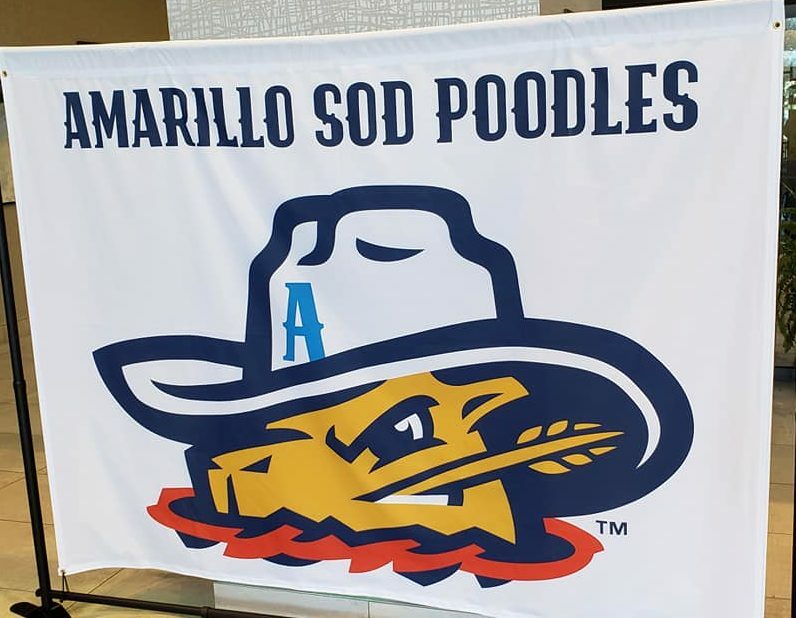 They named our AA baseball team the Amarillo Sod Poodles. It’s official, it’s despicable, and it’s not going to change. 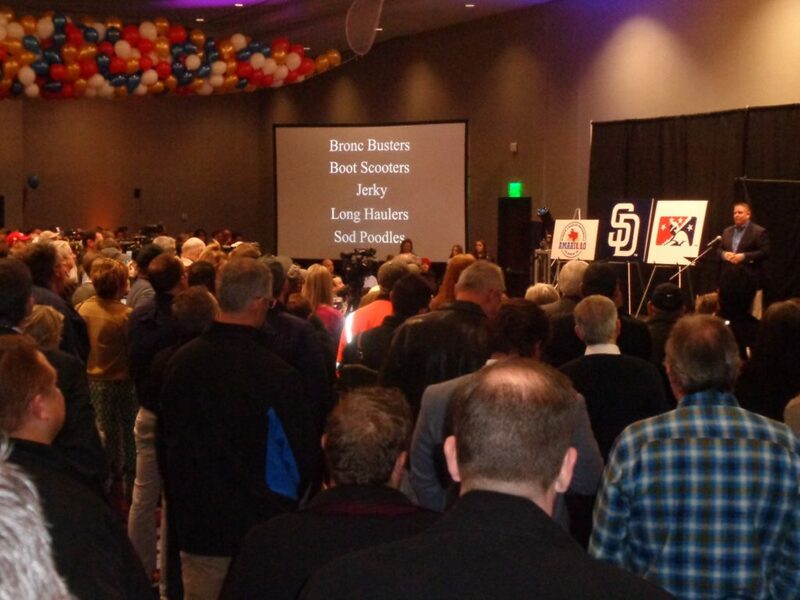 I was in attendance yesterday in the Yellow Rose Ballroom at the brand new Embassy Suites Hotel downtown when the San Diego Padres AA affiliate unveiled the disturbingly absurd moniker. I thought it was a joke right up to the very end. I thought they were telling us Sod Poodles and showing us all the logos, giving us this moment that was anti-climactic at best and humiliating at worst, in order to switch gears and unveil the real name. I kept hoping they would give us a name we would all be surprised by and proud of, a name we’d all hang around and talk about, a name we’d be excited to share with our friends and plaster on the backs of our pickup trucks. One of the many disturbing aspects of this whole thing is the way the national media is blindly parroting the team’s insistence that Sod Poodles is a pioneer-era Texas slang expression for prairie dog. I’ve yet to see any proof. The 70-80 year residents of our city I’ve spoken to have never heard the term. I’m also bothered by General Manager Tony Ensor’s spinning of the city’s response to the name. He’s being quoted everywhere today as saying “the community created the buzz” around Sod Poodles and “this is the direction everyone wanted to go.” He’s using derisive Chick-fil-A signs and tongue-in-cheek lawyer ads and goofy sermon titles from Terry Tamplen at Polk Street United Methodist Church as evidence that Amarillo citizens have endorsed and embraced this move from the start. Like somehow we’re responsible for this! The defense for Sod Poodles has always been that all minor league teams have goofy names. My argument is that you know what all those other names mean. In New Orleans, you know what a Baby Cake is. A Chihuahua is a real dog. You know what a Lugnut is. And a Biscuit. And Sand Gnats. Just like a joke is not funny if you have to explain it, the team name doesn’t work if you have to explain what it means. I’m not a PR guy. I’m not a marketer. Maybe they’re onto something huge. Maybe this is genius. Maybe it won’t matter on a sunny afternoon in April at that beautiful gem of a downtown ballpark. No. It’s Sod Poodles. It’ll have to grow on me. The eleventh chapter of Hebrews gives us the biblical definition of faith: bold action in response to the promise of God regarding an unseen future. Any casual stroll through the Faith Ring of Honor in this chapter confirms what a life of faith looks like, precisely the kind of life that pleases God. By faith, Noah built. That’s action. He built. Noah built when he was warned about things not yet seen. Noah had no physical, tangible evidence that building an ark was a good use of his time and resources. He’d never seen a flood. Most scholars believe he’d never even seen rain. For Noah to build an ark made no sense. But Noah builds. He acts boldly, motivated by what the Word of God told him was going to happen even though nobody had ever seen anything like it before. By faith, Abraham went. Abraham acted on God’s promise even though he didn’t know where he was going. God had told Abraham he’d be given land in the future and that his descendants would be too many to count. And there was no physical evidence to suggest it might come true. He’s 100 years old! His wife’s 90 and barren! But by faith, Abraham went — bold action. He left the certainties of what he knew to take his family into the unknown, relying only on the Word of God. This is the very essence of faith. This is what faith is: a bold action in response to the promise of god regarding an unseen future. By faith, Isaac blessed Jacob and Esau in regard to their future. By faith, Joseph spoke about the exodus of the Israelites from Egypt and gave instructions about his bones. They acted on things that were going to happen in the future. Not today. Not tomorrow. Not next year. 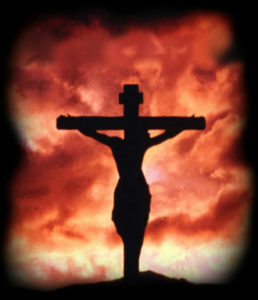 The Word of God, the promise, was going to be fulfilled after each of them died. But they each acted by faith anyway. By faith, Moses chose to be mistreated along with the people of God. Why? Because he was looking ahead to his reward. It made no sense for God’s people to put blood all over their doors. But they did it because they had faith that God was going to keep his promise. Walking down into the middle of the Red Sea, are you kidding me? But had promised to deliver them, so in they went. Same thing with marching around the walls of Jericho. Their only motivation for doing this thing that made no sense was that God told them to. God was doing something. Otherwise, it’s pointless. In Mark 2, four men dig a hole through a roof and lower their paralyzed friend on a mat down to Jesus. And the Gospel says Jesus saw their faith. He saw their faith! Faith is not believing that Jesus can heal; faith is digging through the roof! Faith is not believing God can save; faith is walking into the Red Sea, faith is marching around Jericho, faith is getting up and going where God calls you to go and doing what God is calling you to do! 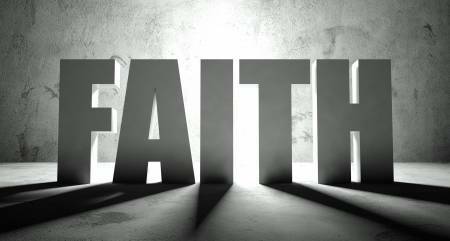 Faith is in the verbs: bold action in response to the promise of God regarding an unseen future. 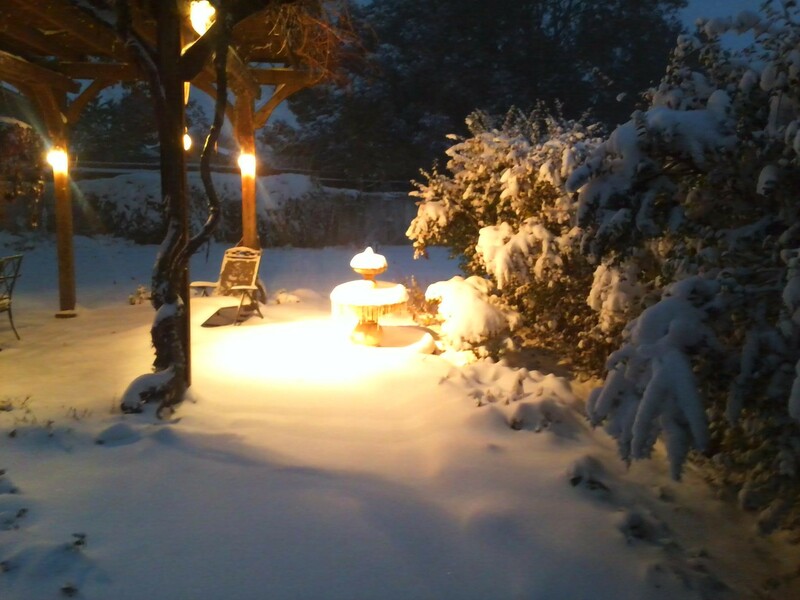 We received more than six inches of snow overnight here at Stanglin Manor, more snow in the past 12 hours than we’ve received total the past two winters combined! It never gets old; I still get excited about the snow up here. The construction on the west side of our church building at Central is finally going up instead of down. Over the weekend, they framed out the arches for the new main entrance. It’s really starting to take shape. The new ground level ministry space is so much bigger than I could realistically imagine. The new welcome center is going to make a big difference. And the main entrance to our building will be obvious for the first time since the mid ’80s! 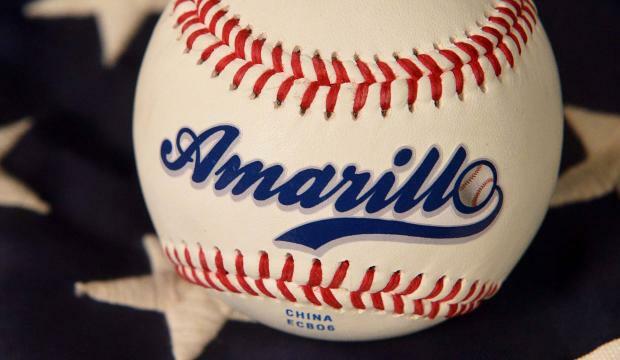 Tomorrow is the day Amarillo baseball fans have been anticipating / dreading for several months. 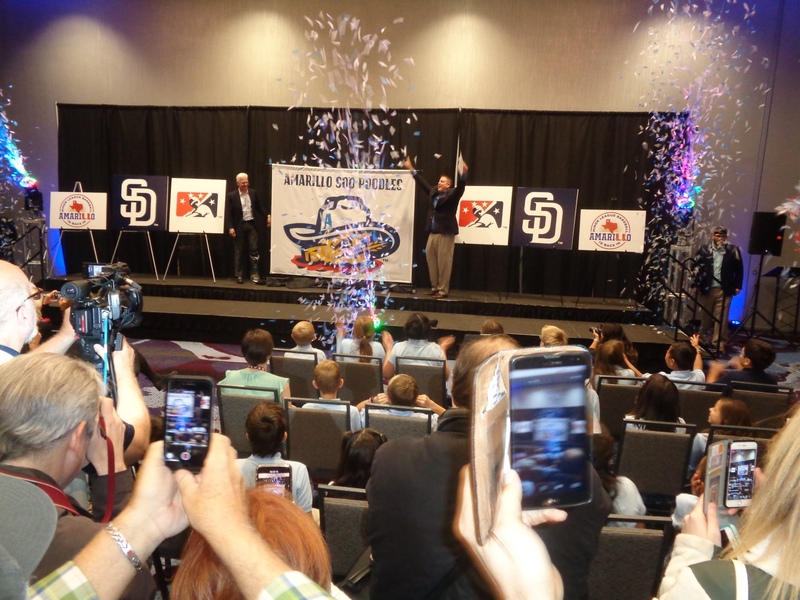 The San Diego Padres AA affiliate, scheduled to begin play in April 2019 at our brand new downtown Amarillo baseball stadium, is announcing the name of the local team. The press conference is at 1pm. Please don’t be Sodpoodles! I’d rather it not be Long Haulers, Boot Scooters, Bronc Busters, or Jerky, either. But please don’t let it be Sodpoodles! The sod arrived from Central Texas on massive trucks overnight Sunday and it was installed in the infield of our beautiful new downtown ballpark yesterday! Now it’s REALLY starting to look like a baseball stadium! The wind in my baseball sails that was completely sucked out by the horrible team name choices is beginning to be revived. Click on one of those hashtags above or the twitter link to see a time lapse of the installation. Seriously. This is what they’ve given us. And they’re asking us to vote for one of those five names. I feel like I’ve been punched in the gut. This is so incredibly disappointing. Embarrassing. I like “The Yellow City Smell” over these five stinkers. I’ve been looking forward to the new ballpark and the new team for more than three years now. Since ground broke on the brand new downtown stadium, it has felt like we’re on the verge of something special. It’s been so much fun. Yesterday morning I was in an email conversation with three friends trying to figure out how to split up a season ticket package. We were picking seats, planning to put down deposits, looking at dates. And then the news broke in the middle of our discussion and it just sucked all the air out of everything. We dropped it. We quit. It was devastating. It completely ruined my day. I’m inconsolable. I’m questioning my faith. I was going to buy the cap and the sweatshirt, I was going to put the logo on my laptop and the back of my truck. No matter what the team name, I was going to be all in. 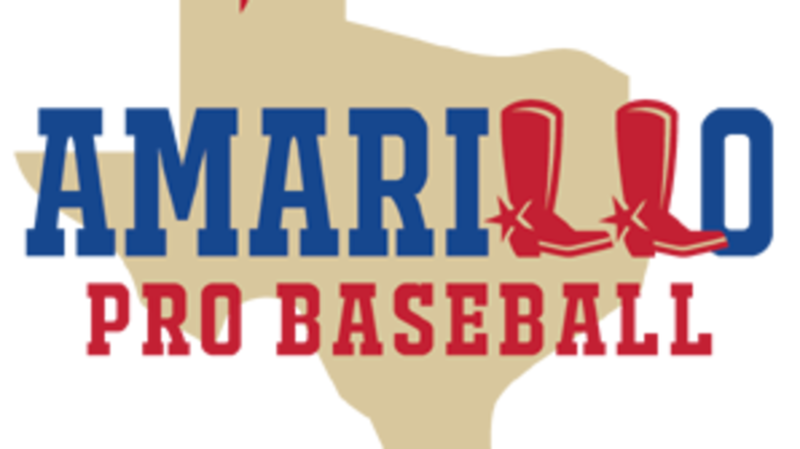 This was going to be something we could all embrace as a community, something to be proud of, something that would represent Amarillo to the rest of the Texas League and the rest of our great state. I was looking forward to being surprised by the genius of the new name and wholeheartedly adopting it and making it my own. I can’t get behind any of these five finalists. I can’t cast a vote for any one of them. And nobody else can, either. Some of the names mentioned in the comments section of the petition make a lot more sense than the five finalists. The Amarillo Twisters. The Tumbleweeds. Hay Makers. Slammers. Yellowjackets. Bombers. I’m actually beginning to really like Hay Makers. It can refer to a knockout punch or a dramatic development, plus, you know, we do make a lot of hay up here. I think Cow Patties makes more sense than the five finalists. I’d rather go with something plain and generic like Eagles or Bulldogs or Mustangs than any of those five. I have a theory. I believe the team threw Sod Poodles and Jerky in there just to get people talking, to stir up some controversy and garner lots of attention. Those awful names are guaranteed to generate passion and to make all the local newscasts. Those names gin up traffic and drive folks to the website where they feel compelled to help make sure a proper name is selected. The problem is that the other three names are dogs, too. The plan has backfired. 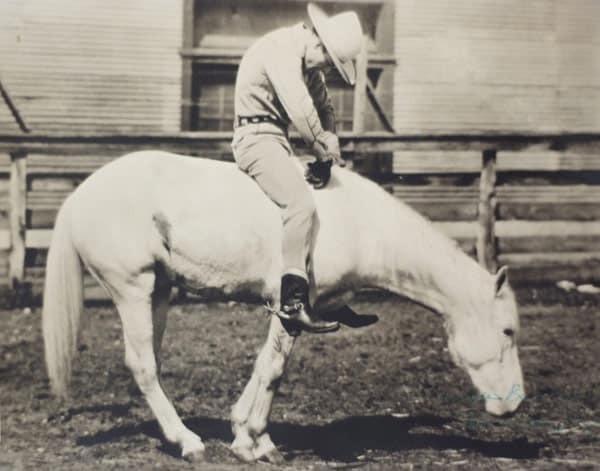 Boot Scooters and Long Haulers are just as bad as Jerky! The only hope here is that the baseball team’s experts are right and thousands of Amarillo residents and baseball fans are wrong. I was in the stands at the old Arlington Stadium in the summer of ’93 when the Texas Rangers announced the name of the new stadium to open in 1994 as “The Ballpark in Arlington.” Rangers P.A. man Chuck Morgan made the official announcement in between innings of a home game and it was immediately and mercilessly booed by every person in attendance. I remember Rafael Palmeiro, who was playing first base during the announcement, bending over at the knees and gut-laughing at the terrible reaction. It was awful! The Ballpark in Arlington?!? How much did they pay a consulting firm to come up with that?!? It was criticized in the press and ridiculed by the fans. And then it somehow became magical. And traditional. And almost sacred. When the naming rights were sold in 2003 and it became Ameriquest Field, we all hated it. Most of us don’t call it Globe Life Park. It’s still The Ballpark in Arlington. Majestic. Maybe the same thing will happen with our team name here. Maybe a couple of years from now I’m OK with wearing an Amarillo Long Haulers T-shirt or driving around with an Amarillo Boot Scooters logo on the back of my truck. Maybe. But I’d much rather see the next five names on the list. People in the United States in 2018 still need to be rescued from the present evil age. Yes, we are still living in the present evil age. And it’s especially hard for us to see it because, for us, this current age doesn’t seem so bad. I’ve got both hot and cold running water in my house. I have central air-conditioning and heating. I have cable television in four rooms on HDTVs with DVRs — unparalleled clarity in picture and sound. I’ve got a microfiber reclining couch. And I’m always either eating, just finished eating, or about to start eating. Most of the time, for me, for all of us, this present age seems pretty sweet. What’s so evil about it? Well, for starters, all the TVs and computers and iPhones mean that we are more aware than we’ve ever been before of just how broken this world is. It’s evil. Vulgarity and violence, racism and sexism, lying and lust — and that’s all coming from the good guys! There’s untold poverty and disease and death, weather disasters, wars and threats of more wars. In the end, ultimately, there is no place in this world where you can find a firm foundation for your hopes and dreams. I don’t know what’s going to take you down, but something will. Something will wreck your hopes and dreams. A tornado, flood, or fire. Heart disease, cancer, or Alzheimer’s. Adultery or divorce. The death of someone you can’t imagine living without. You can’t escape the disappointment. You’re either dealing with it right now or you’ve already experienced it or it’s coming. There is no fixing what’s wrong with this present age. The world is broken and we know it. We’re broken. And all the ways we try to fix ourselves and this world are also broken. We can argue about the things we see that ought to be changed. We can fuss about whose party and which leader should be in charge of those changes. We can spend our whole lives rearranging the deck chairs on the Titanic and, yeah, maybe we’ll succeed in making life a little more tolerable for our fellow passengers. But we know deep down inside that we cannot stop this ship from sinking. It’s going down. And we all need rescue. There is only one solution for this fallen world. There’s only one thing that can fix what’s gone wrong with creation. The answer to what’s wrong with the world is a whole new world, a brand new reality where the only law is “You shall love your neighbor as yourself.” Christ Jesus died and God raised him from the grave to make that new world a reality. Jesus does that. Jesus rescues. Jesus saves.